My wife Jae and I were on a cruise ship. We were walking inside the ship on the Promenade deck. We exited the mid-ship starboard door to the outside promenade deck. Standing at mid-ship were stacks and stacks of puzzle pieces, which went all the way forward to the bow of the ship. We looked towards the aft of the ship, saw the deck covered with a beautifully colored puzzle. The puzzle was complete from mid-ship all the way to the aft. The puzzle pieces fit perfectly on the deck’s shape and exactly matched scribed lines on the wooden deck planks, which were guides as to where each puzzle piece fit. We could walk on the puzzle without tearing it up. Since we could not go forward on the Promenade deck, we decided to go up to Lido deck until more of the puzzle pieces are in place. Jae went up the stairs first and I climbed up afterwards. When I got to the top, I lost my balance a bit and rocked backwards just a little. Suddenly, I felt a hand steady me and gently push me back into balance. I then walked across Lido deck to where Jae was. Noun: A paved public walk, typically one along a waterfront at a resort. Verb: Take a leisurely walk, ride, or drive in public, especially to meet or be seen by others. When I see cruise ships in dreams it means the sovereign and encompassing plan of God. The ship has a captain and the ship has a hierarchical crew, which takes care of the passengers along the journey. As passengers, we spend our day occupied with various activities and trust that the captain will steer the vessel along a safe and predetermined path so that we may safely arrive at our destination. The outside promenade deck was complete from the aft to where we stood at mid-ship. Each puzzle piece matched the scribed lines beneath the puzzle. The scribed lines are of God’s design and laid there by Him marking out our journey together. We could look back to the aft of the ship and see where we had been and felt comfortable with all the things that had happened in our lives, knowing nothing had caught God by surprise. We easily walked on the finished puzzle because we knew the author’s hand had laid it down securely. In the dream, we leisurely walked on the promenade deck, which is our public walk. The promenade deck on most cruise ships has shops, restaurants, casino, entertainment, and the like on the inside which represents daily life. The outside of the promenade deck offers a scenic path around the ship and it all comes with fresh air, the sound of the ship cutting through the ocean waves and beautiful views of the ocean and distant horizon. The outside promenade deck represents our enlightenment and awareness of the spiritual walk together with all of God’s creation surrounding us. The sights, sounds and immensity of His creation bring such comfort and connection to a believer. The puzzle was colorful and beautiful up where completed at mid-ship. The stacks of puzzle pieces not yet laid represent what is to come. We don’t know what the unfinished puzzle will reveal but we do know the Master Puzzle Maker, and we trust our lives to Him. We couldn’t go forward so we chose to rest and wait on God to complete more of the puzzle since it is by His design and not ours. It’s hard to wait patiently on God until you learned to trust Him. Apostle Paul learned to be content where God had him. Joseph waited in the Potiphar’s house and prison for thirteen years before Joseph became second only to Pharaoh. Joseph needed puzzle pieces to be in place before he could proceed to the next phase of his life. It so vitally important to trust in God and believe he has created a perfect plan for your life. That doesn’t mean your life will be easy, nor without conflicts and trials. In fact, following God’s plan for your life may look just the opposite of easy and trial free. To the outside observer you will often appear out of God’s will, even an outcast to people who do not truly know what the Walk requires. Know that following God may separate you from friends, family, city of dwelling, occupations, doctrines of man and the like. We each have to submit to God’s santification process in our lives. My wife and I call it “soul” work. It can be so painful when God pinpoints an area where He wants to work so we can become fruitful and free in who we are in Christ. I believe the true walk in Christ based solely on building a relationship with the Father through Jesus Christ. Take away job, home, friends, even family and if you have Christ, then you have everything. Nothing else truly matters. We cannot be who we are to become as believers without an intimate relationship with Jesus Christ our Lord. Learn to live and love the small things in life. Embrace the simple, even mundane task and you will begin to see this is God’s best and in His plan for each saint to learn. His name was John Bradley Morrison. I first met him early in 2004 at a morning bible study hosted by Pastor Ken Smith of Heartland Church in Brownwood, Texas. Brad was handsome, charismatic, funny and had an infectious smile, the kind of gentleman you hoped to know better. I sensed that somehow our lives were going to be connected in some way, little did I know just how much. Just days before Brad walked into Heartland Church, he introduced himself to Pastor Dawn and told her of his past. Brad said to her, “I want to know God, am I in the right place?” She said, “You’re in the right place and you’re not the first.” Brad’s past mistakes troubled him and caused him great pain in his life. I wanted to see Brad hook up with us in our bible study and win in Christ and he did just that, Brad became a doer of the word and grew in the faith week by week. He was so hungry for the Word, that we nicknamed him “Sponge Brad Square Pants,” he identified with the name and even got up once in front of the whole church and spoke of those early days in his pursuit of God and his new nickname. From time to time I would counsel with Brad and he’d talk about the pain of his past and how it was troubling his soul. His job required him to drive many miles each day from city to city, as he drove, Holy Spirit would settle on him at times and he would weep and weep. God was washing him and cleansing him over and over again. 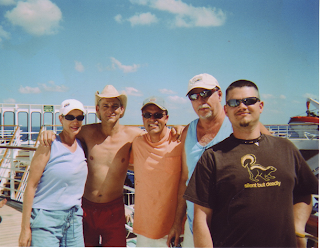 In mid-October, 2006, Brad went on a church group cruise. I remember Brad and several of us were touring through the ship before we set sail. We walked into one of the lounges where they had Karaoke in the evenings. Brad did great impressions, especially of Hank Hill as well as other characters, so we asked him to step up on the stage and entertain us, we took our seats as he began to do impressions. Unknown to us there was a man behind the curtain who was tuning a piano, the man began to play a song and Brad sang along with the tune. After hearing Brad sing for a few bars, we heard the man from behind the curtain say, “Next!” Brad said, “Next song?” The man responded with, “No, next entertainer!” We all cracked up in laughter. In the summer months of 2006, my wife and I were shown in dreams and visions that Brad and our daughter Wendy were to be married. We didn’t say a word to either one of them but in late October, Brad came to my wife and I, to her son Jason, his wife Jodie and our pastors and asked permission to date our daughter; It was pure, holy, God ordained and the one word that best describes Brad is “honor”. They dated in our living room, we called it “the parlor” and kept their relationship pure before God, sensing a divine appointment had come into their lives and they didn’t want to mess it up. Little did we know, that we were all on a path of a divine encounter with God. Our Brad knew how to make everyone feel special regardless if it was the first time you met him or as a long time acquaintance. Wendy and Brad married December 8, 2006 in the living room of our home and the ceremony was attended by his family and pastors. During the wedding, Holy Spirit moved upon Wendy’s brother Jason as he went into travail and continued throughout the entire ceremony. Brad was diagnosed with cancer in June of 2007, it was inoperable and he was valiant in his fight, standing in faith each day. He never complained or showed any anger or bitternress. So many people were praying and standing in faith right alongside with him even though we weren’t seeing the healing manifest that we knew God could do at any moment. When I asked the Father why we hadn’t seen his healing manifest, I heard Him say, “It’s about the testimony.” The next morning while in my quiet time, I asked the Father to help me better understand the testimony and He said, “You have to understand the testimony.” I knew then that things weren’t going to go the way we all expected, I knew that God has something special planned, but we would have to walk this out together with Brad to see what it was. As the months passed and Brad’s illness progressed, the Lord began to show us that there wasn’t going to be a healing miracle for him, and yet knowing this, we still prayed and battled right alongside with Brad every day. Two weeks and six days before Brad passed away, we went and picked him up from his home and brought him over to our house for the afternoon. He loved it in our home, it was a special place for him and has been for years for those who love God. He wept at the thought of leaving so we let him stay as long as he wished. Five days before Brad passed away he came to Wendy and my wife, telling them he didn’t feel ‘right.’ My wife came and asked me to come and pray for him. When I laid hands on his shoulders, I immediately went into travail, voicing to God in deep anguish all of our discouragement, pain and disappointment. In the battle against cancer, we had arrived at the place where there was nothing else we could do spiritually for Brad. As long as I live, I don’t think I will ever forget how helpless it feels to be in that place. As we were praying for him that night, I saw a vision of Jesus suffering on the cross, He was struggling for breath as his body lifted up and then back down. Jesus and I were breathing in sync together, over and over as He labored to breathe, I labored to breathe. I suddenly knew this was why Jesus bore the cross for all mankind, so we could come when we are helpless, hopeless and desperate and in time of need. Oh, the cross, how dear it us to the saints of God. Brad fought the good fight of faith and his body and soul was tired, and his quality of life had all but diminished. It was time to release him to Jesus at the cross and in deep sorrow I released Brad to Christ. When I did this, the mood of the holy encounter with Christ changed, I told my wife and daughter to listen, God wanted to speak. My wife and I didn’t hear anything but his wife Wendy heard, “I will come to Brad tonight and reveal Myself to him.” After that, the travail lifted, leaving the three of us in awe of this holy encounter with Jesus and the presence of God that rested upon us afterwards. That night, the Lord gave me a dream about what happened in the encounter that evening, He showed me a very corporate hand-off procedure that represented Brad was being handed off to Jesus. I saw an envelope with Brad’s name on it being transferred from our hands to Holy Spirit and then to Jesus. I woke up immediately after the dream at 2:00 AM and cried out to God, “Why Brad, why him Lord?” I heard the father say, “Brad has lived a tormented life and even tormented in death. He’s with Me now”. 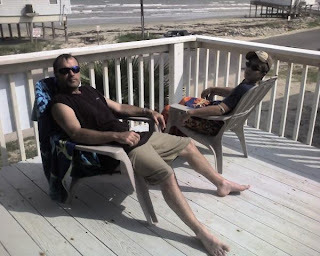 Brad bravely kept his faith and as our dear pastor ministered words of comfort to him that is was okay to go on and get his reward in heaven, he responded with a barely perceptible “amen.” Brad’s physical struggle eased and he went into a place of peace. Earlier the nurses were administering pain medicine ever half-hour and after prayer with his pastor, to my knowledge, he didn’t need anymore. Brad slipped away four hours later on Thursday, April 3, 2008 in our home, he was surrounded by his family. The night of his passing, I was awakened in the middle of the night by the Lord and once again I asked Him to help me understand the testimony, I told the Father our hearts were saddened and we needed to understand. The Father began to say, “I didn’t do what was best for Me but what was best for Brad”. Truly, God would have a received a great testimony should the miracle have occurred, and I thought of the analogy of a card game, where God was holding an unbeatable hand but chose to fold so Brad could win. Brad could have been healed but it wouldn’t have ended his torment. Some of us have things in our past which the judicial system and society has labeled us with. Brad lived with this every day. Everywhere Brad lived his past followed him, there was no way of getting away from it as long as he lived. This is the testimony that to those who love God you can trust Him to do what’s best for you in every situation regardless what it pertains too. The Father once asked my wife, “Do you want me to give you what you think you want or what you really want”? Trust Him in every situation and I pray that you will get understanding and grow in knowledge of Him character each day. Brad’s now totaly healed and experiencing glorious wonders beyond our ability to express or understand. The life and spirit behind his inspired prayers will continue to bear fruit in our lives and produce a great harvest in the days and years to come. I look forward to seeing him again when Christ comes! 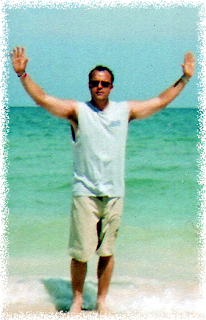 In loving memory of a dear son, a brother in Christ, whom we were proud to know, to love and whom we will miss dearly.